I love tomatoes. Love them. On sandwiches, in mac+cheese, with cucumber in vinegar, on top pizza, broiled with cheese on top, in salads... I could list more, but you get the idea. I adore tomato season. As I previously mentioned, SP brought home a bunch of tomatoes from the farmers market. 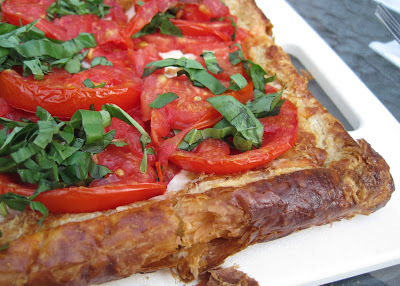 Sure, we could eat them plain, or sliced and drizzled with balsamic syrup and basil (one of our favorites) but since I had recently been paging through some cookbooks and had seen some recipes in recent food magazine issues, I had tomato tart in mind. But which tomato tart recipe? There are a lot out there. 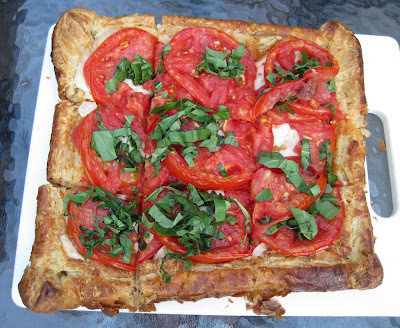 The one that first got my mind stuck on a tomato tart was a tomato pie recipe in one of the recent food magazines, but it used mayonnaise with the tomatoes, and the mayo was then baked and turned into a supposedly delicious gooey sauce. But SP is anti-mayo so I figured he'd never go for that recipe. And honestly, the mayo part of it turned me off. I thought about making the same tomato tart recipe that we made last year, the one from my puff pastry cookbook, but I sort of wanted to try something new. Not that the puff pastry cookbook tart wasn't tasty - it was delicious, I just wanted something else. 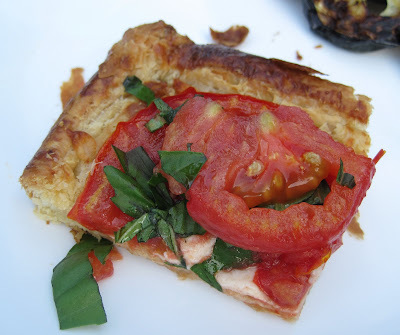 Although now that I re-read that post, I am thinking we need to make tomato tart again next weekend. 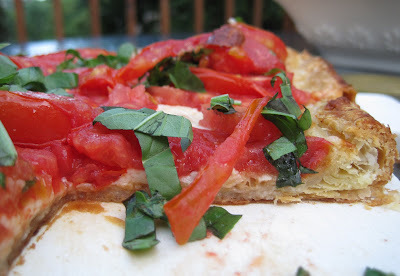 I settled on the tomato & mozzarella tart recipe from Baking Illustrated. We halved the recipe. It's simple: roll out puff pastry, sprinkle with parmesan, prick with a fork, bake, cool a bit, sprinkle with mozzarella, top with sliced tomatoes (that have been salted and pressed between paper towels to remove some of the moisture), drizzle with garlic infused olive oil (yes, we used plain olive oil), bake, sprinkle with chopped fresh basil. Delicious. 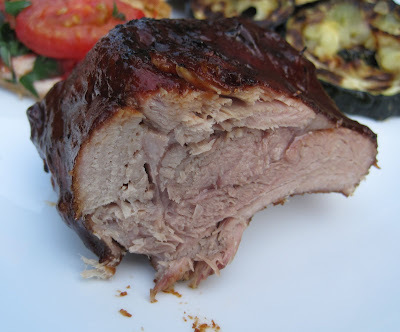 Along with making the tomato tart, we grilled a lot of stuff for dinner. 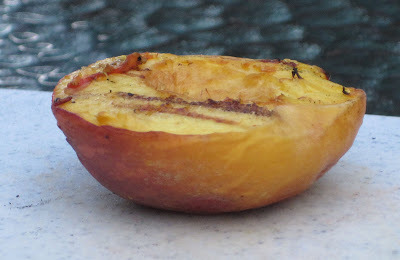 Eggplant, zucchini, onions, corn on the cob (none of which I bothered to photograph) and these: Grilled peaches! 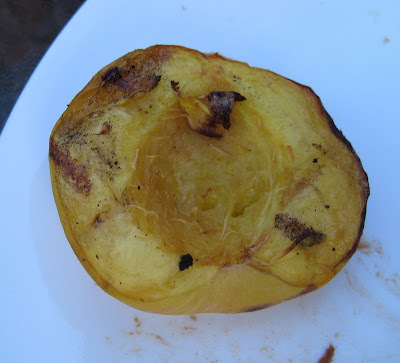 I have to admit, when SP gets it in his mind that he wants grilled fruit, I usually turn my nose up a bit. I'm not sure why. As usual, despite my initial sneering, I really enjoyed the grilled peaches. 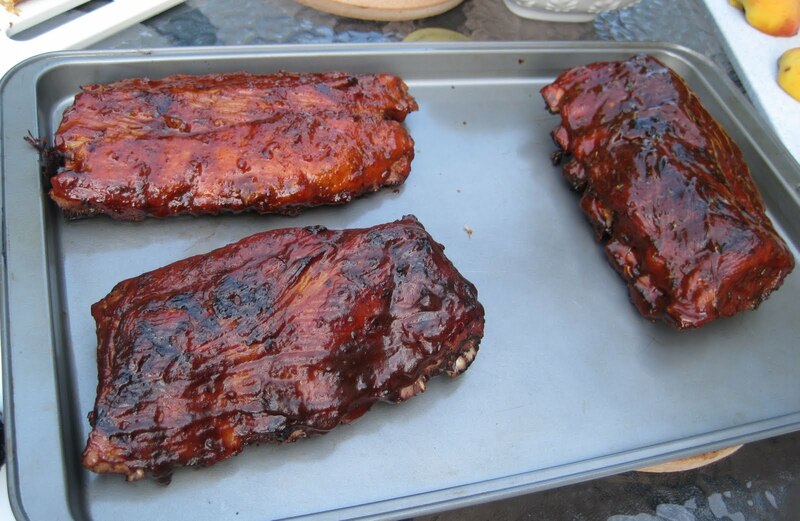 We also made EPAS' ribs again. This time, we used a store bought McCormick Sweet & Smokey Rub with Cinnamon & Chipotle. Top left is the Peach Grilling Sauce from Dahlonega, GA. Under those are my Jack Daniels ribs, And on the right, SP's homemade BBQ sauce ribs. 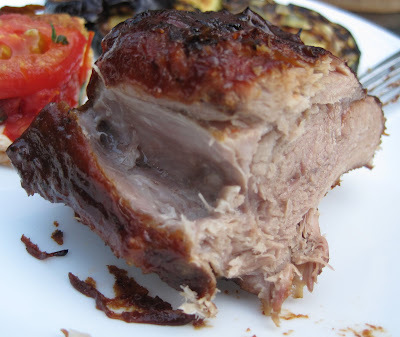 Fall off the bone tender. Above is my serving. I took a forkful and here's how it pulled apart: It was a cooler, breezy evening, so we were able to sit comfortably outside on the deck and enjoy our dinner. I love summer, being able to grill, the tomatoes, the fruits. So good. 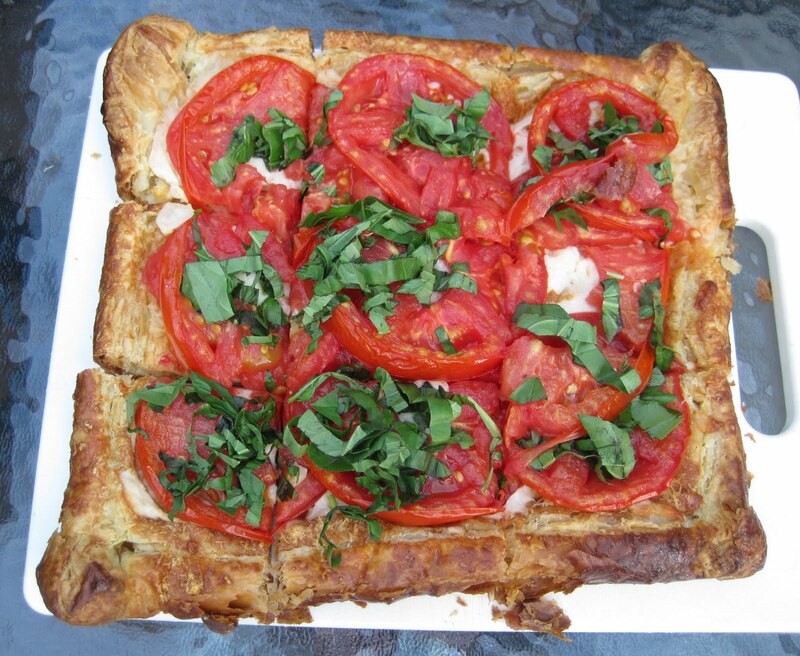 Tomato tart? SERIOUSLY delicious-looking. I'm running out to the store today or tomorrow for some puff pastry. Replace the mozzarella with firm tofu and it'll be a tart even a vegan partner could love.